Tate Modern presented from April and until October 2013, the world’s first major museum exhibition of Lebanese artist Saloua Raouda Choucair (b. 1916). Comprising over 120 works, many of which have never been seen before and were exhibited for the first time, this exhibition brought together paintings, sculptures and other objects made by the artist over six decades, reflecting her interests in science, mathematics and Islamic art and poetry. Tate Modern presented from April and until October 2013, the world’s first major museum exhibition of Lebanese artist Saloua Raouda Choucair (b. 1916). Comprising over 120 works, many of which have never been seen before and were exhibited for the first time, this exhibition brought together paintings, sculptures and other objects made by the artist over six decades, reflecting her interests in science, mathematics and Islamic art and poetry. In Choucair’s 97th year, this retrospective celebrated her extraordinary body of work and her contribution to international modernism. Choucair is a pioneer of abstract art in the Middle East and is now becoming recognised as an important figure in the history of global modernism. A rare female voice in the Beirut art scene from the 1940s onwards, her work combines elements of western abstraction with Islamic aesthetics. It is characterised by an experimental approach to materials alongside an elegant use of modular forms, lines and curves drawn from the traditions of Islamic design. 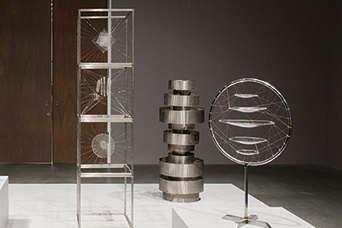 The exhibition focused on Choucair’s sculptures from the 1950s to the 1980s, created in wood, metal, stone and fibreglass, as well as key examples of her early paintings such as Self-Portrait 1943 and Paris-Beirut 1948. The artist often created works in discrete series, a number of which were included in the exhibition. These included her ‘interforms’, such as Sculpture with One Thousand Pieces 1966-1968, which comprise of seemingly simple cubes or blocks which house intricately carved and highly complex internal forms. Works known as ‘duals,’ consisting of two carefully interlocking parts, and a selection of her modular ‘poems’ series were also on display. These works are made from individual pieces that stack together in a flexible way, much like the stanzas of Arabic poetry. Choucair thought of many of her works as being in constant flux: structures to be altered by the viewer, the elements or the artist’s own additions and subtractions over time. Like a Mobius strip her work is endlessly various, returning to specific themes but never with the same attributes or form. Born in Beirut in 1916, Saloua Raouda Choucair began painting under the tutelage of leading Lebanese landscape artists Mustafa Farroukh and Omar Onsi. She studied at the American University in Beirut and the Ecole des Beaux-Arts in Paris, and attended the studio of Fernand Léger in the late 1940s. After a period in the United States, she returned to live and work in her homeland in 1955. Throughout the 1980s and 90s Choucair received increasing recognition and awards for her work in Lebanon, including a number of commissions for public sculpture in Beirut. Her work has been shown at UNESCO Palace in Beirut, the Beirut Exhibition Centre and most recently in a display of newly acquired works at Tate Modern. A widespread marketing campaign took place both prior to and during the exhibition’s run at Tate Modern through Tate’s established communications network, advertising, promotions and digital marketing to promote Saloua Raouda Choucair to national and international audiences. Marketing consisted of adverts on billboards, in press and online, and posters were positioned at key London Underground stations. Advertorials reached the Arabic community in London and across the UK. The Saoula Raouda Choucair blog and website content was seeded to Tate social media networks including Twitter and Facebook, and the exhibition was also promoted in email bulletins to Tate Members and Tate online users. In addition to the exhibition, Tate Learning programmed a British Sign Language Tour (Friday 2 August), a Lipspeaker Tour (Friday 9 August) and a Curator’s tour and private view (Monday 7 October). This programme was designed to open up the exhibition and the work of Saloua Raouda Choucair to wider audiences and to enhance visitors’ learning. Due to its popularity, Tate Modern extended the display of Saloua Raouda Choucair for an additional month, enabling additional visitors to experience the work of this extraordinary artist. Saloua Raouda Choucair attracted over 70,000 visitors during its 7 month run at Tate Modern. Saloua Raouda Choucair generated excellent press coverage both during the lead up to the show and throughout its run. The exhibition was previewed in various publications, including the Independent, Daily Telegraph, Wall Street Journal and Guardian Guide. The press view was held at Tate Modern on Tuesday 16 April and was well attended by journalists, photographers and film crews. The artist’s daughter, Hala Choucair, was interviewed alongside the exhibition’s curators, Jessica Morgan and Ann Coxon, and positive reviews followed in The Guardian, Evening Standard and The Times. Broadcast coverage included news stories on BBC World News and BBC News Online, as well as discussions on BBC Radio 4’s Front Row and Radio 3’s Nightwaves. Online picture galleries ran on the Telegraph and BBC websites and further online coverage included Huffington Post, Londonist and One Stop Arts. The exhibition was chosen as an exhibition of the week in The Times and Guardian Guide and a 4-star review was published on the Female Arts website. The exhibition was featured in Art Quarterly’s summer issue, in which the artist was described as ‘an important figure in the history of global modernism’. The Lady praised Tate Modern’s trend for highlighting the work of a generation of female artists who have seemingly toiled unnoticed for years’ and the Socialist Review commented on the way Tate Modern’s exhibition programme highlights lesser known Arab and African artists.